It’s Vacation Time! Is Everybody Happy? This Memorial Day weekend it was snowing at my home in Vermont, but now that the sun is out — and we’re supposed to get 80-degree temperatures in a few more days — perhaps we can relax and believe that summer is finally here. For many of us, in addition to pulling endless weeds, summer means vacation! Will those vacations make us happy? According to research, yes. A February 2010 New York Times article reported on findings from the Netherlands that vacations do in fact make us happier, if nothing goes wrong, like an illness or a fight with your spouse. The Dutch researchers found that the biggest happiness hit comes from anticipation. We can also savor the joy of vacations in the present moment. Not only that — Sonja Lyubomirsky notes in The How of Happiness that we can savor these experiences in retrospect, especially with the aid of photographs. 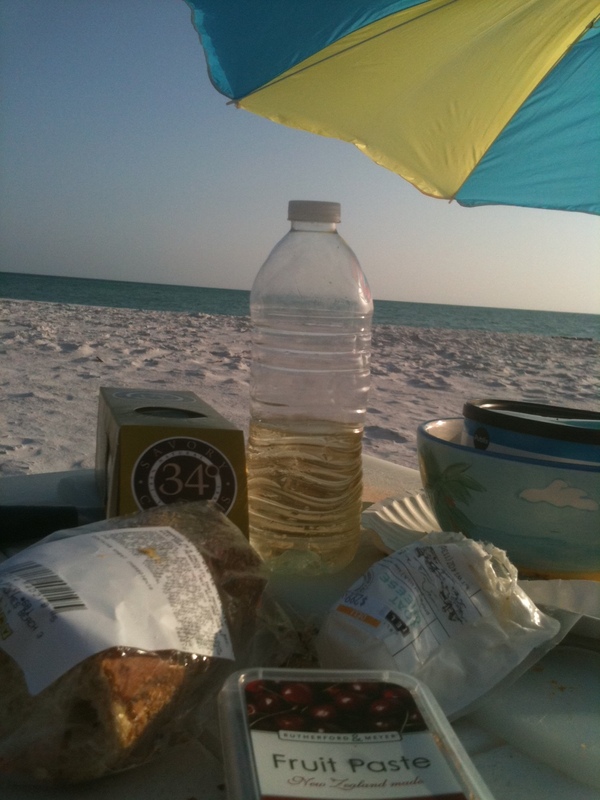 A very happy evening with a simple but savory meal on the beach. Okay, that’s the research, that’s the theory. But how does it work in “real” life? This has been on my mind because a month ago, when I was returning from a blissful week long stay at the beach, I was not happy. Rather, I was close to tears — and a little bit angry, too. The anger — or maybe it was resentment — was toward those (temporarily?) fortunate souls who were just arriving on the island and toward those with the financial resources to afford second homes and lots of time in this heavenly spot. I felt like living proof that our country’s extreme income inequality breeds unhappiness. I also felt spoiled, petty, and not very highly evolved for even thinking in these terms. First of all, the trip was an amazing Christmas present to me from my very loving husband, and throughout the week, I was filled with gratitude for him. But the desire to stay longer overwhelmed me with sadness. Ah, desire — the cause of so much suffering! Further, I know that comparing ourselves with others is insidious and a sure fire recipe for unhappiness. Yet there I was, comparing away, and finding myself very much wanting … Never mind that I was still in a warm, sunny, carefree place while most of my friends were stuck in climates where winter just wouldn’t let up. Or, the much broader comparison with all the pockets of desperate unhappiness in the world. I was looking at those with more money and more time than me, and that comparison was anything but cheer inducing. I’m pleased to report, I’ve got my happiness equilibrium back and can look at photos and videos of the trip and feel joy. I still long to return, but that longing functions more as an inspiration for me to take the steps I need to take to make that happen. It’s now a goal, and goals can increase our happiness. Can increase our happiness, or not — depending on the goal! A month out from my sad state of desire and social comparison, I’ve landed on three thoughts: first, happiness is a process; second, the ground rules can seem murky sometimes; and third, never underestimate the value of a mindfulness practice. A Lifelong Process: In my happiness workshops, I like to quote writer Margaret Lee Runbeck, who said, “Happiness is not a state to arrive at, but a manner of traveling.” I also like to compare cultivating one’s own happiness with maintaining flexibility through a regular yoga practice. It’s not something we can do once or twice and declare victory. We have to stick with it to maintain our happiness muscle tone. So maybe my vacation deprivation was a little teeny tiny example of income inequality — and maybe, much more so, I was a loud example of the need to maintain one’s happiness practices. After all, I read about this field all the time, and I try to heed the wisdom of the great science of happiness thinkers. Throughout the week, I consciously savored the experience, expressed gratitude, exercised, and even went to yoga class twice. It wasn’t enough to carry me through the departure. Guess I’ve still got work — a lot of work!! — to do on my happiness journey. The murkiness of happiness practices: Driving home, I mulled over the complexity of happiness strategies. For example, savoring. Really, it was a sweet, sweet week — perfect weather, and we saw many wild animals in their own habitat (including a snake that liked our patio, and two manatees in a nearby canal) — with much to savor. But, did that make it harder to let go? Then there’s social comparison — obviously, a source of distress for me. Yet, comparison with others can serve as a spur, providing us with the role models we need to follow. For example, there was a lot of time for people watching on the beach, and I saw many fit bodies of all ages — an inspiration to me to be more physically active and stay as healthy as I can for as long as I can. Envy may be destructive, but looking at a woman older than me in great shape, and thinking, “Wow, good for her! Maybe I can do better, too!” seems very positive and an excellent motivation for long-term happiness. Mindfulness: I’m beginning to think all roads lead to mindfulness. It seems like any happiness question or strategy you examine includes a crucial element of awareness. In this case, thankfully, I was aware and self-reflective. While I felt bad for myself, I knew that was a) petty and b) temporary. Mindfulness helps us make better choices. I say that I now have a goal of getting back to this gorgeous island, but at what cost? Do I focus on making money for a vacation rather than follow my true calling? Do I choose a tropical vacation trip over a visit with my granddaughter? Meditating helps me find the answers to these and an infinite number of other questions, big and small. I also know that so much unhappiness can come from wanting. Wanting, wanting, wanting. And yes, that wanting can sometimes serve us, but more frequently it leads to unnecessary suffering. A meditation practice is so crucial to building and maintaining an awareness of what really matters in life. Meditation also strengthens our capacity for compassion. In my sadness at leaving behind a week of joy, perhaps I could have had compassion for myself; compassion for those who get to spend more time on the island but undoubtedly have their own suffering; compassion for those just arriving for their week’s vacation and who might be as sad as me the following Saturday; compassion for my friends enduring a snowy April; etc. That’s a very big etc., and I’m sure you can fill in the many, many blanks. I often practice a loving kindness (aka, compassion) meditation, but I did not meditate on this vacation. I’m sure it’s natural to feel a sense of loss when vacation ends — the high of a good vacation is by its nature fleeting. Still, I wonder if meditating while on vacation would have made departing an easier pill to swallow. Hmmmmm … maybe I’ll give it a try next time.